MUD cooking stoves commonly used across rural India are known to cause health problems and contribute to global warming. They emit black carbon. Improved cookstoves are being developed and promoted to reduce these adverse effects. 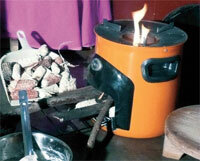 But a study has found that some improved cookstoves at times emit more of the black carbon than traditional mud stoves. Researchers from Scripps Research Institute in the US compared black carbon emissions from a traditional mud stove and four improved cookstoves. The improved cookstoves were of two models—natural draft which has structural modifications to enhance air flow and forced draft, which additionally employs an external fan to force air into the combustion chamber of the stove. The comparison revealed that forced draft stoves burned cleaner than the other stoves. It reduced the black carbon concentration near the plume zone by a factor of four in comparison to natural draft which reduced it by a factor of 1.5. Moreover, the black carbon concentrations from all the improved cookstoves varied significantly, even for the same stove from one day to the next. Some natural draft stoves occasionally emitted more black carbon than the traditional mud cookstove. But none of the forced draft did so. The variation in performance means a more cautious approach is needed for improved cookstove assumptions and terminology, the authors note in the study published in the April 6 issue of Environmental Science & Technology. Forced draft stoves should be considered for dissemination under improved cookstove programme worldwide, they add. This is significant as the programme is increasingly being used as a clean technology to mitigate climate change.